A driver of a flatbed truck fell asleep behind the wheel Thursday and crashed into a school bus. injuring multiple students in Colorado. The driver of a flatbed truck fell asleep at the wheel and crashed into a school bus Thursday, injuring multiple Colorado high school students, investigators said. None of the injuries appeared to be life-threatening. Colorado State Patrol Trooper Gary Cutler said the truck drifted into oncoming traffic on a rural road and sideswiped the Greeley-Evans School District bus near the small town of Hudson, northeast of Denver. The bus, which had 35 people on board, including 29 students, left the road, rolled one and quarter times and came to a rest on an oil and gas site. District spokesman Casey Pearson told KMGH-TV in Denver that 19 students were taken to the hospital, and the bus driver was the most severely hurt. Three people in the truck also were hospitalized, according to Cutler. But Stephanie Cooke with the Platte Valley Fire Protection District gave a conflicting report Thursday night, saying 27 people were taken from the scene in nine different ambulances. 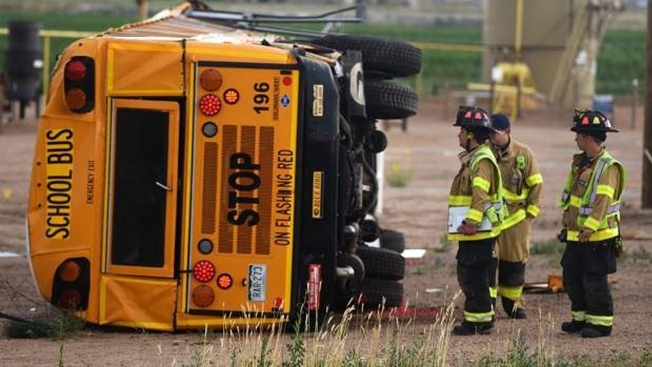 The students from Greeley Central and North Ridge high schools were headed back from a field trip at an amusement park in Denver at the time of the crash. All of the people on the bus were able to get out by themselves, according to Cooke. The Colorado State Patrol tweeted that none of the injuries appeared to be life-threatening. Aerial footage showed the bus on its side as a group milled around the accident site, which was dotted with multiple ambulances and police cars. The truck was nearby in a corn field.